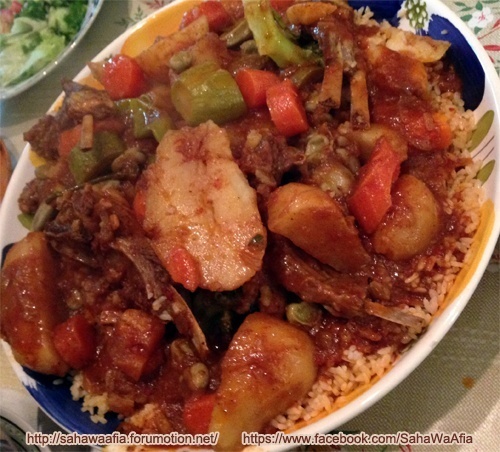 This is a traditional and very satisfying Libyan meal which I encourage you to try The vegetables are so colourful and delicious and very good for you. It's very suitable for when you are having guests too. 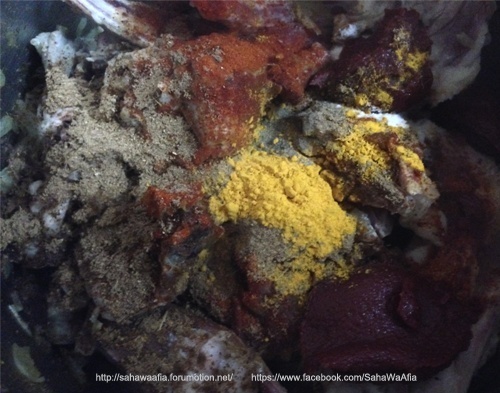 1/2 teaspoon each of Red Pepper, Baharaat ( mixed spices similar to garam masala) and Turmeric (also a little ground black pepper if you like). Chop the onion and fry it - stirring it from time to time - heat not too high so as not to burn it. Add to this 2 or 3 chopped tomatoes (can be put in the blender with a little water). Also add 1-2 tablespoons of Tomato paste/puree. Fry a little longer then add enough water to cover. Put the rinsed rice in the steamer and cover with a firm-fitting lid above the cooking meat and it's sauce (add a few extra cups of water to the stew to allow for evaporation as the heat needs to be quite high to produce enough steam) - leave it for approx 10 minutes until the rice absorbs some of the steam and almost becomes one solid mass. 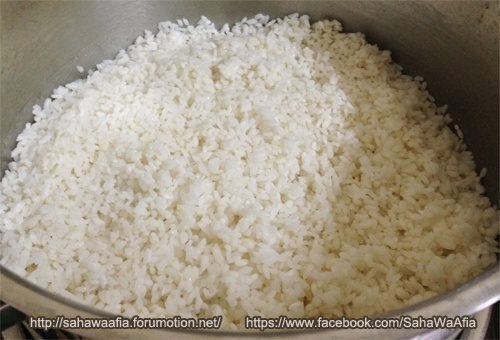 Remove the rice into a large bowl (you will need a large spoon to scrape out the rice) and cover with tepid water and leave for approx 5 minutes so that the rice absorbs some of the water (you will see that it starts to form little peaks and start to rise above the water - like small islands) break up the rice a little in the water - be careful it's still quite hot. 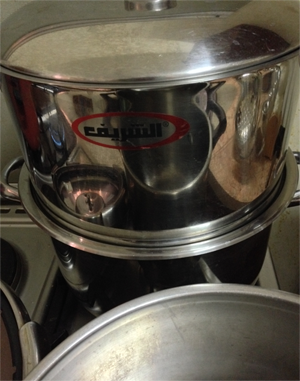 Strain the water off the rice, then return the rice to the steamer. Pour a small amount only of Olive oil or other cooking oil onto the rice and stir it around a bit then cover again with the lid. 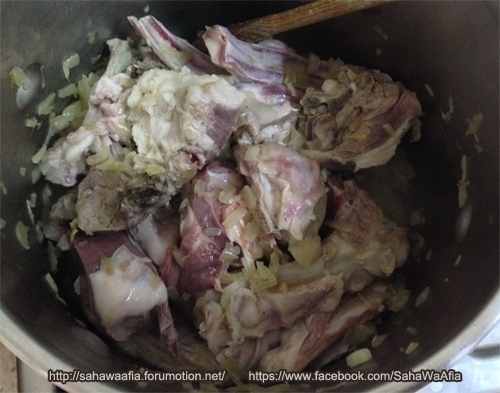 Check from time to time that there is sufficient water in the stew - giving it a stir to prevent the meat from sticking to the bottom of the saucepan. Also give the rice a stir occasionally - perhaps every 10 minutes. Pumpkin (cut into potato sized chunks) or Carrots. When the meat is cooked remove it from the 'stew' and keep it hot (perhaps in a small saucepan with a little of the liquid from the stew. Then add the vegetables to the stew in the pan to cook for approx a further 20 mins or however much time is required. 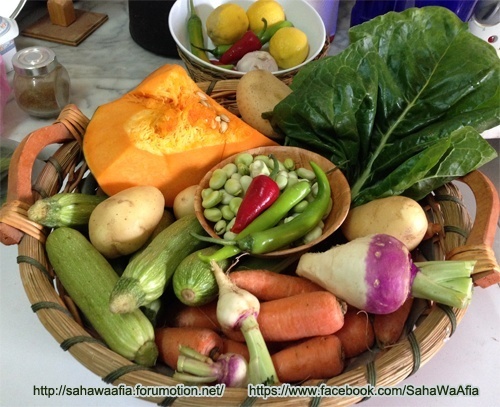 It is a good idea to add the Pumpkin and Cabbage a few minutes after the other vegetables as they need less time to cook. 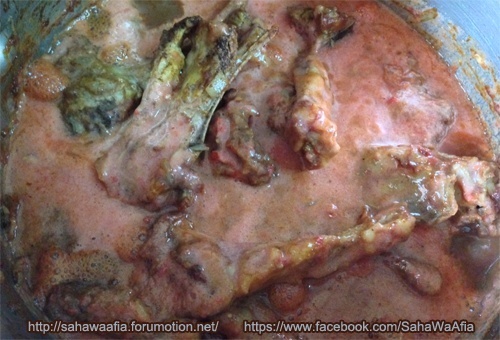 The rice may be cooked before the vegetables - it should be quite firm and 'nutty' inshaAllah. 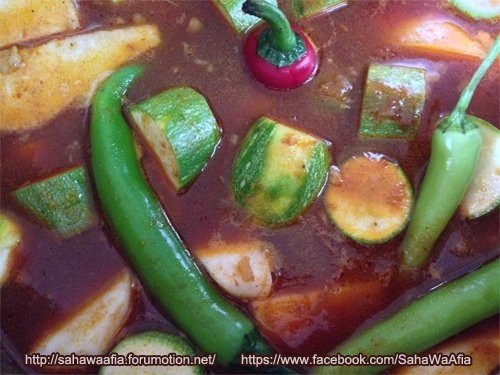 From time to time you can also add a little of the liquid from the stew over the rice while it is in the steamer. It is almost impossible to go wrong with this rice as it cannot burn or get too sticky. Mix a little butter into it and a sprinkle of salt at the end of the cooking time.